Keeping track of where items are in your store is an important part of good warehouse practice. You don't want to have to go hunting through your whole store for an item, wasting time and energy when mSupply can tell you exactly where it is! Locations in mSupply are the places you store items. Locations can have types (e.g. normal, cold, bulk…) to help you categorise them, you can define parent/child relationships between locations to help you manage them effectively and you can even create a line drawing plan of the location to pictorially show the layout of your store. If you use location types it will help you if they are defined before the locations that belong to them otherwise they won't be available to select when defining a location - and you'll have to go back later and edit the locations. What a waste of time! So this section explains location types first and goes on to explain about locations. 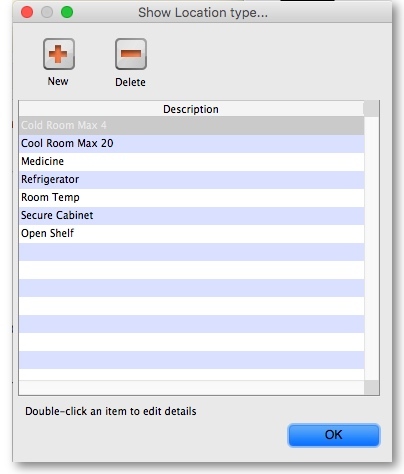 Choose Item > Show location types to define or show a list of available location types. The window that appears allows you to define the criteria for the various types of location in your store - e.g. the permitted temperature range, whether location must be dark, etc. In the above example, a storage type “Refrigerator” has been defined, the permitted range of temperature being 2o C - 8o C.
It is worth emphasising that the list does not show the actual store locations, but the types of locations. Should you wish to edit the details of any location type, double click on it in the list and change the details in the window which appears. New location icon: Click this to add a location (see 'Adding a location' below). Print icon: Click this to print the list of locations displayed in the window (see 'Printing the locations list' below). Show warehouse icon: Click this to see a graphical representation of your warehouse. This representation shows all the layouts of the individual locations that you have created in the layout tab when adding a location (see 'Adding a location' below). Search location: Enter some text in the text field and the list is updated as you type to show only the locations whose code or description starts with the text you have entered. view and edit a location's details: Double click on a location in the list - see 'Viewing and editing a location' below. All the details are editable. See the 'Adding a location' section below for the meaning of the individual details. Code: This is how you refer to the location in mSupply and, for example, what you will select when you set an item's location. Description: This is a description of the location e.g. “Top shelf of refrigerator 3” or “3rd shelf up in rack E” to help you identify it or remember something important about it. You will only see this in the list of locations shown above. Location Type: Select one from the location types you have already entered (see Location types section above). Parent: Select one from the locations already entered in mSupply. This is the location to which the location you are adding belongs. This is for descriptive purposes and does not have any functional effect in mSupply, except when viewing the warehouse layout. Summary: Checking this means that the location is a summary location only and cannot be used for storing items. This is normally checked for all locations that are parents of others. Comment: You can note anything you need to remember or indicate to others in here. 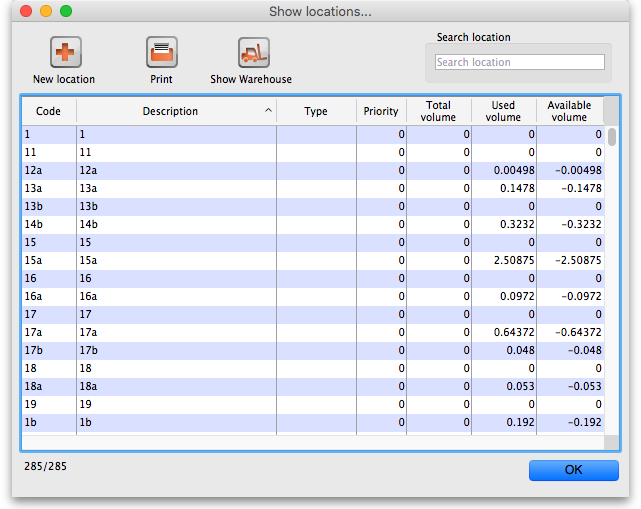 It is only visible if you view the location's details (Item > Show locations, double click on the item in the list) later. Total volume: The total volume of goods that you can store at the location. Volumes are stored in cubic metres [m3] but other volumes e.g. litres (l) may also be entered, provided the appropriate unit is entered following the number e.g. 5l for 5 litres. See the entry Volume per pack in Item edit - General options. Note that whatever you enter will be converted to and displayed in m3. Knowing the volume of a location is important if, for example, you are replenishing your stock of vaccines, and you need to know if there is enough space available in the refrigerator in which you store vaccines to accommodate a new order (obviously, you would also need to know the volume of the vaccines that you are ordering). Priority: This is used when printing a picking slip. Setting a priority for a location will override the default alphabetical ordering of shelf locations in a picking list. A location with a lower priority number will be printed before a location with a higher priority number. All locations with 0 priority are counted as having no priority and will be printed, in alphabetical order, after all locations with a priority. The stock needs to be kept from being issued until some inspection / approval (e.g. quarantine). The stock is a bulk quantity with the same expiry date as another stock line in another location from which you want stock issued. You can use this feature to force mSupply to always suggest issuing stock of this item from the 'issue' location rather than this 'bulk' location. Move the stock in that location to another location that is not On hold Remove the On hold status of the location here. This has created a picture of location main1. This is the whole store or warehouse. You can't see the settings but this location will have no parent and will have its Summary checkbox checked (no items can be located here - it's just a summary location for descriptive purposes). In our imaginary warehouse we have a set of open racking which is 'L'-shaped. We want to draw it in the warehouse so we create the location, call it 'sub1' and set its parent as Main1. If this set of shelves also has other locations in it we would also check its Summary checkbox. You can do this same thing for all locations so that anyone can easily locate them in your store. This is the same as the General tab for adding a location (see the 'Adding a location' section above) except that its details are filled in with the details of the location you selected. 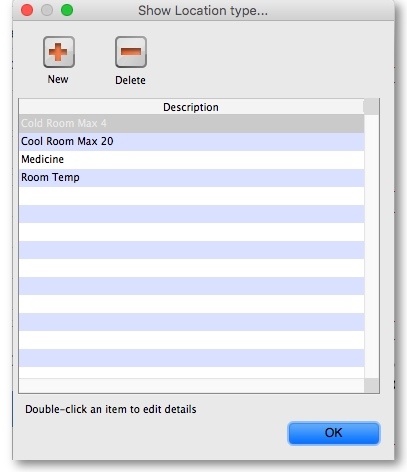 To edit the details simply overwrite the current value with a new value or select another option as appropriate. This is the same as the Layout tab for adding a location (see the 'Adding a location' section above) except that the current graphical representation of the location is displayed (if you've already created one). You can edit the plan view of the location if required by changing, adding or deleting co-ordinates. To delete location you select Item > Show locations to view the list of locations, double click on the location you want to delete (as if you wanted to view all its details) and then click on the Delete button at the bottom of the window. If you confirm the deletion, the location is removed. If you want to remove a location from further use in mSupply (for example, you might have accidentally double-entered a location) this command can be used. Use extreme caution! This operation will affect all historical records of the location you delete. They will be moved to the location you are keeping. The operation can only be undone by reverting to a backup copy of your data file. 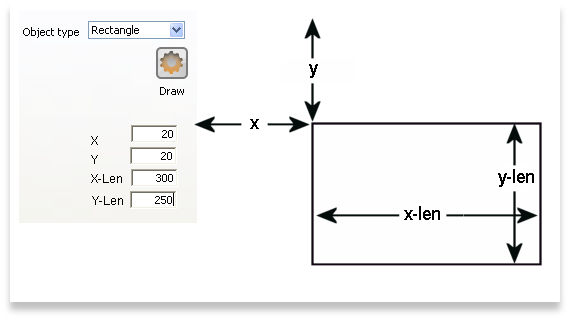 In the window displayed enter the location to keep, and then the location to merge. When you have checked that the information is correct, click the OK button.